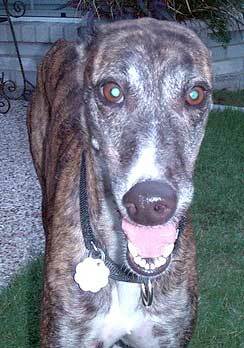 Tina is a gorgeous 3-year-old dark brindle female born May 24, 2003. Her sire is JB Junior B and her dam is Betty N Tina, aka, her namesake. Tina is the "g" pup in the litter and was not registered with the NGA. Tina arrived with Romeo and Blazer as part of a neglect case monitored by the Lamar County Animal Shelter in Paris. Tina, fortunately, is in the best condition of all three. She is very shy and cowers when she is approached, so she will need a lot of patience and TLC. Tina is cat tolerant but has not been tested with small dogs. Tina is a shy, very sweet little girl. 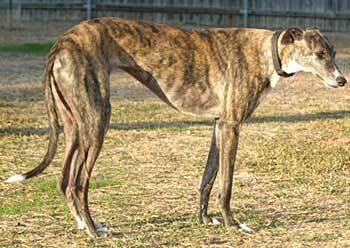 She is gorgeous, with dark brindle stripes. Tina is extremely well behaved and easy to have around. She gets along well with our other dogs, and loves to run and play. She loves toys and is very interested in chasing squirrels in our yard. Feeding time is one of her shy times. We feed her a short distance away from the other dogs, so she is more comfortable. She loves her crate and is crated while we are gone. At night she sleeps in the bedroom on a dog bed, and every morning nudges my hand and kisses my face to wake me up. She is slowly coming out of her shell and is blossoming into a very friendly, affectionate little girl. When she plays she becomes very animated and this is fun to watch. She would make an excellent addition to your home, and certainly deserves the best couch in town!